The crowd moves silently through the spectacular Red Square in Moscow, Russia on a balmy summer evening flanked by the magnificence of St. 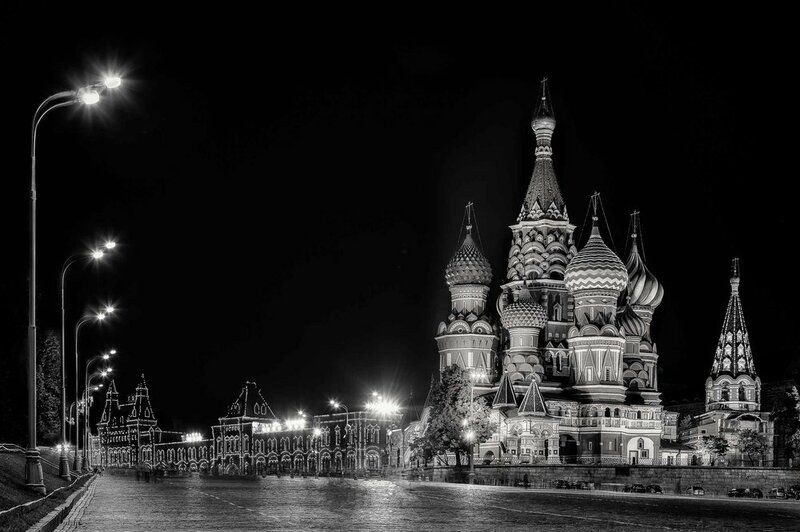 Basil's Cathedral and the Kremlin. The notion of movement within a still image is an amazing concept. I achieved the effect in this photo of Red Square in Moscow through a long exposure. It was a lovely, warm summer’s evening yet the crowd of visitors presented various problems for me. They weren’t so much moving through the space as lingering for periods of time, prior to ambling along a little, stopping and moving on again. During my time there, thousands must have passed through the space. What’s more the tallest of them seemed to always end up right in front of my camera’s lens. I’m patient, but there are times when an alternative approach is required. Because I had a professional looking DSLR camera on a nice, big Really Right Stuff tripod I was continually being handed mobile phones and asked to photograph other people. I’m happy to do so, but sometimes the process seems almost endless and, naturally, it shouldn’t prevent me from making my own photos. Still, I’m in no position to order folks around. What’s more I really don’t want to get in anyone’s way or impede their progress through what is, after all, a public space. As it was well after sunset when I made this image I allowed the relatively low light levels to work in my favor. I set my Canon 5D Mark II camera to ISO 100 and the lens to f/11 to achieve a large depth of field (DOF). Under that level of illumination the low ISO combined with the relatively narrow aperture required an exposure time of 20 seconds. As you can see that produced variations in the degree of stillness with which the figures were recorded and, as a result variations in movement have been introduced to the still photograph and a nice sense of duality achieved. Other than that it’s a very straightforward image. The warm colors of the buildings, further accentuated by warm artificial lighting, is beautifully contrasted with the intense blue of the summer evening sky. We’re so often rewarded for our efforts. I’ve just noticed that the clock on the right of the image shows the time as 10:10pm. That’s serendipitous because commercial photographers have historically positioned the hands of a watch or clock at 10 minutes past 10 for reasons of design. The result is aesthetically pleasing, that's all. It just looks good! The quiet of night at St. Basil's Cathedral in Red Square, Moscow, Russia. I’d encourage you to explore night photography. It’s a wonderful time of day when time seems to slow and the marrying of structure, light and weather can produce incredibly beautiful results. However, you certainly need to watch out for drunks and those wanting to do you harm. Likewise, your expensive camera kit can be a temptation for thieves. I do my best to remain alert to those dangers at such times. You might also consider heading out with a fellow photographer or two for mutual support and to remain in areas that are well lit and not completely deserted. Sometimes the best approach is to photograph a sunset and continue photographing for an hour or two afterwards. Most times of year that should ensure that you’re leaving the location at a reasonable time of night before many of those nasty types emerge. My advice is to embrace creative opportunities through your photography, but to make sure you keep your wits about you. Is Flare Always A Problem In A Photograph?